I recently discovered a really fun and super nutritious new ingredient. You know, as in "cha-cha-cha-chia pets!" Personally, I think they're totally worth the ear worm I give myself every time I make up a batch. 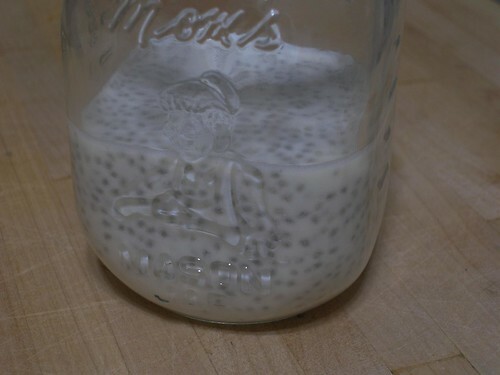 The original recipe that I'd read was basically a spoonful of sugar (I used honey instead) and a spoonful of chia seeds in a glass of water with a squeeze of lime juice. But, as you can see in that first picture, it's much prettier, as well as tastier and healthier, with a bit of pomegranate juice added in. 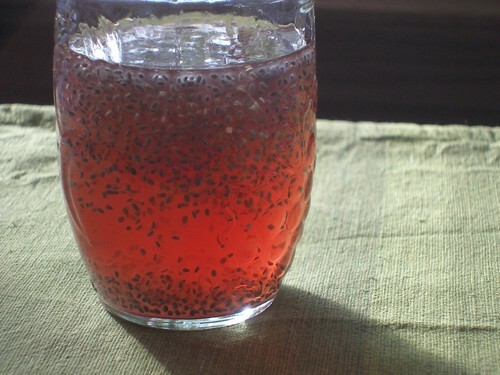 The kids drink it despite, or possibly because of, the fact that when soaked, chia seeds start to resemble gelatinous little fish eggs. This morning I also tried mixing a spoonful with some freshly made almond milk and a bit of honey and the kids loved it that way too. Too me, it seems a bit like thin tapioca. I'm not sure if everyone out there will like it, but we're going through the stuff like it's candy. Where in the world do you get chia seeds in that quantity? Oh, I meant to ask if you could mix it in a food, like sprinkle it in oatmeal? Hi Wendy! I remember we used to eat those all the time growing up. My dad would make it for us. I think it's a pretty common Asian drink. I remember it being sold in cans in the drink aisle of Asian stores. I haven't had it since probably high school. I remember it had a jelly-ish texture to it and I looooved crunching on the seed portion of it. :) I'm almost pretty sure you can buy them in a decent quantity at Asian grocery stores still. Hey, neat! I see them at the hippie store, but always assumed folks were sprouting them to eat the sprouts. Lesson learned. Do you know if they are nutrients are absorbed adequately when they are whole as opposed to ground up? Just wondering, as I know that can be an issue with flax seeds. Wander (Linda), they sell them at the health food store. And I only used one tablespoon per drink. Though the official serving size is about 3 tablespoons (I thought I'd start slow to give myself time to adjust to all that fiber... just in case). Also, I'm sure you could stir it into oatmeal. Arunrith, (Hi, Chula!) I will definitely have to check out the Asian market next time we go. These are totally jelly-ish and, in fact, sort of remind us of those Asian bubble tea drinks. And I like crunching the seed part too! Anna, I originally had plans to sprout them, but haven't gotten around to it. I bet they'd be fantastic on sandwiches. And the nutritional information that I linked to lists it for the dried seeds, so I'm guessing that it would be OK whole. You can totally mix it in any food! Brad originally bought the white version (labeled Salba at health food stores). They say you can mix it in salads (they stay kind of crunchy like sesame seeds), drinks or shakes (they get gelatinous with crunchy middle), anything you bake or cook like soups, stews, and yes, oatmeal (not sure what happens with the texture yet). Well, now I have to try these. I imagine Whole Foods would have something like this, yes? It looks like the stuff they pour over falooda at Indian restaurants. Super good! love chia. we order it by the pound from Mountain Rose Herbs. so many good ways to cook with it. yum yum. A friend told me this could be used to make an egg substitute like flax seed is used (blend 1 part flax to 3 parts water until thick; 3 tbs = 1 egg). Have you ever tried that? I know I'm a little late to comment, but is a serving size 3 TBS dry or of the chia gel? Also, will you be sharing your almond milk recipe? Aries Mommy, it's for 3 T dried. And I guess I should do a recipe for the almond milk. It's so simple and tasty.